All donations are in U.S. Dollars and are tax-deductible where applicable by law. Friends of the New Message contribute on a monthly basis to the core work of The Society. For years, the Friends have provided a solid foundation for The Society’s growing endeavors. Friends of the New Message are individuals who commit to giving at what ever level is possible for them. Become a Friend. Pillars of the New Message are an integral part of the foundation for the education and outreach mission of The Society. A Pillar of the New Message commits to giving $100 or more every month. 300 Pillars are needed to meet annual costs. Being a Pillar is an expression of your relationship with the New Message, its Messenger and its urgent gift for the world. Become a forerunner in the world and a way shower for others who are seeking to live an inspired life and carry out their purpose in an emerging world. Become a Pillar. Join the Worldwide Community of people who recognize the immense value of God’s New Message and commit a portion of their resources to support the ongoing work of bringing this Revelation to humanity. To discuss these and other options for benefactor giving, please contact Will Burrows at (800) 938-3891. 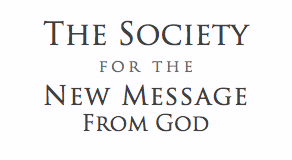 The Society for The New Message from God is a religious non-profit 501(c)(3) organization registered in the United States, dedicated to presenting and preserving the sacred texts and recordings of The New Message from God. The Mission of the New Message is being accomplished by the members of The Society alongside a dedicated team of volunteers that span the globe. If you would like to offer your skills and join this great endeavor, please fill out the Volunteer form. Do you shop online and are you interested in raising funds for The Society for the New Message? Use the links below and The Society will receive between 2%-12% of the value of your purchase at the following stores and retailers. In this way students of the New Message can benefit The Society through their normal shopping activities. Use the GoodSearch Search Engine. Every search you perform gives $0.01 to The Society. See a list of all the supporters using GoodSearch. Shop online from the goodshop site which gives a percentage of many online purchases to The Society. Donations can also be faxed to us at 303-938-1214. Please include your name, address and phone number, as well as the amount you would like to give, your card number and its expiration date. For information on other methods of donating, please contact The Society at society@greatercommunity.org 303-938-8401. All contributions are tax-deductible where applicable under law.